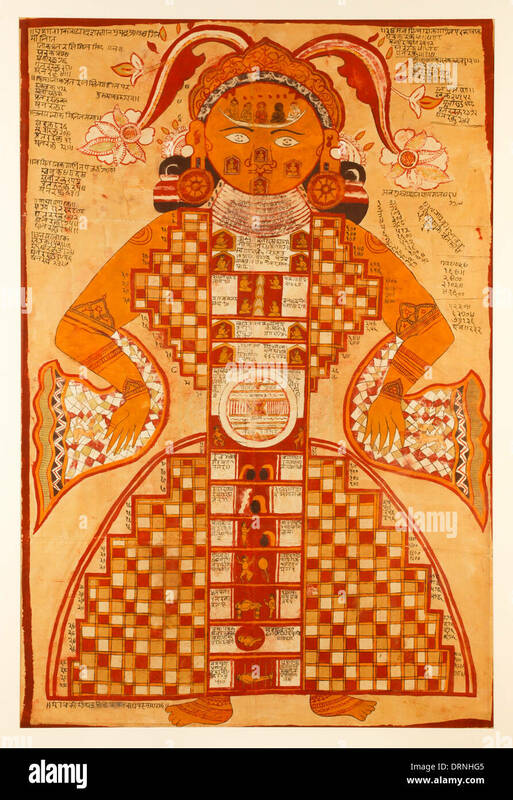 Purushkara Jain, Yantra figure cosmique gouache sur soie de Rajasthan Inde vers 1780 montrant le ciel et l'enfer Jambudvipa. A Jain Purushkara Yantra. gouache on silk from Rajasthan India circa 1780. Cosmic figure showing circular World Jambudvipa at center. Seven levels of hell are shown in the legs, with the heavens in the upper body. Eight Jinas are painted on the face, accompanied by sacred Sanskrit symbols surrounding the body. Used as a focus for mantra by Hindi yogi and in Jainism and Buddhism to reach a transcendental state.